Both beginners and experienced anglers are strongly advised to hire the services of a local guide for the first few days on the water. They will know the best flies, appropriate tackle and local fishing lore. Similarly, on salmon and trout rivers, the services of a local guide (also known as a "ghillie") will ensure that the angler gets the most out of a visit. The Foyle System, which runs through counties Tyrone, Londonderry and Donegal, is one of the premier salmon fisheries in Europe. Wild brown trout are plentiful in Ireland’s rivers and loughs; and indigenous species such as dollaghan, sonaghan, gillaroo and ferox can be found in Lough Melvin, County Leitrim, and Lough Neagh, County Antrim. 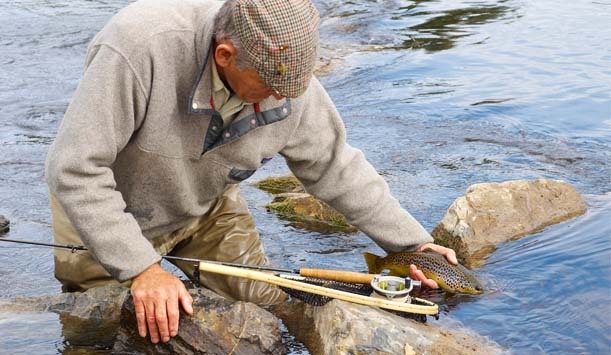 While game fish can be caught on all legal methods, such as worms, spinning, and so on, fly-fishing is the traditional practice for catching salmon and trout. Great hatches of duckfly, mayfly and sedges are the seasonal triggers for top quality trout fishing on many of Ireland’s rivers and lakes. All anglers are looking for rich rewards, and our rivers and lakes in the Shannon, Erne and Lower Bann catchments are filled with catches of over 50kg. The specialist angler should, however, visit the Royal Canal in Mullingar, County Westmeath, for specimen tench and carp; the River Barrow, County Carlow, for specimen perch; and the Lower Bann, County Derry-Londonderry, for specimen bream and roach x bream hybrids. Try the Upper and Lower Lough Erne for bream and the Fairy Water in County Tyrone for roach. Killykeen in the Lough Oughter complex in County Cavan; Hope Castle at Lough Muckno, County Monaghan; and Lusty Beg on Lower Lough Erne in County Fermanagh, offer fishing and recreational facilities for the whole family. For added excitement, match anglers should book themselves into the festivals running at Portumna and Ballinasloe in County Galway, Edenderry in County Offaly, Prosperous in County Kildare, County Leitrim's Carrick-on-Shannon and the county of Cavan to name just a few. The big lakes, such as Loughs Erne, County Fermanagh, Derravarragh, County Westmeath, Ree, County Roscommon, or Derg, County Donegal are good starting points for anglers as they offer large numbers of free taking pike. A boat trip on a quieter lough, such as Macnean in Fermanagh, Muckno in Monaghan and the Lakes of the Dromore River system in Cavan, may even turn up the elusive specimen. Fly-fishing has become an increasingly popular method for taking pike in Ireland and gives exciting sport with fish of all sizes. In Dublin, you can fish for pike along the canals: the Grand and the Royal, as well as along the Barrow Canal in Carlow, and the Newry Canal in County Down. On the south and west coasts, sub-tropical species such as triggerfish, red mullet and gilt-head bream intermingle with coldwater fish, such as cod, coalfish and haddock. Further north in the Atlantic, there are cold water species: tope, pollack, thornback rays and sea bass. One of the best ways to experience sea fishing is to join a charter vessel from a specialist centre. For the south and west coast that means spots such as Kilmore Quay on Wexford's coast, Cork Harbour in Kinsale and Westport in County Mayo. In Northern Ireland, Portrush and Ballycastle in County Antrim, and Portstewart, County Londonderry are the best locations to aim for. There are sunken wrecks along these shores – remnants of two world wars – that are home to large numbers of specimen cod, coalfish, conger, ling and pollack. It is here that Irish records were set in the past and certainly will again in the future. Small boat angling is developing all around the coast; and salt water fly fishing for sea trout, bass, pollack and mackerel is growing in popularity and can be practiced almost anywhere the shore touches the sea. In both Northern Ireland and the Republic of Ireland, licences are required for salmon and sea trout fishing. 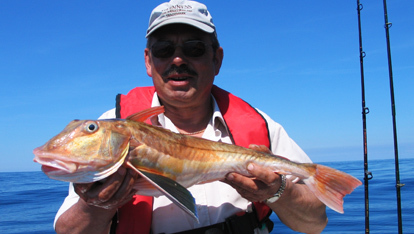 Sea fishing for marine sport fish does not require a licence. While no licence is needed for trout, pike and coarse species in the Republic of Ireland, a rod licence is required in Northern Ireland. On a number of trout and coarse fisheries, a local permit may also be required. There are currently conservation laws governing salmon, sea trout, brown trout, sea bass and pike. However, new conservation measures may be implemented at any time. Check out the information from the Central Fisheries Board and on the Department of Culture, Arts and Leisure Angling in Northern Ireland websites for up-to-date information on all licence and permit regulations.